A man tries to unify the churches in Palmyra. Joseph gives a prophecy about Deacon Jessup that is fulfilled. Joseph goes to the hill September 22, 1824, and is unable to obtain the plates. A lesson from the angel on keeping all the commandments. Joseph works for Josiah Stowell in Harmony, Pennsylvania. The frame house is completed. Joseph becomes acquainted with Emma Hale. Very sad notice which appeared in the Wayne Sentinel, Wednesday, September 29, 1824, ten months after Alvin’s death. This spacious frame house was Alvin’s idea. Hyrum and some neighbors would finish it. The Isaac and Elizabeth Hale home in Harmony Township, Pennsylvania, has recently been restored. Josiah Stowell lived in this area when Joseph Smith came to work for him. Joseph the Prophet would later state: “Could you gaze into heaven five minutes, you would know more than you would by reading all that ever was written on the subject” (History of the Church 6:50). In all former versions of this work, Lucy’s story of Joseph’s 1824 visit to the Hill Cumorah has been placed before the death of Alvin. This was because Lucy’s account of his death was recorded as November 19, 1824, rather than the correct year of 1823. In this version the accounts have been placed in their proper chronological order. It appears that the Lord was preparing not only Joseph to receive the record but the whole Smith family as well; for all would face severe trials from the world for their support of Joseph. Josiah Stowell was born at Winchester, New Hampshire (just twenty-three miles south of where Lucy Mack Smith was born), in 1770. Josiah’s last name has also been spelled Stoal and Stowel. It is well to note that Joseph was, of course, on the Hill Cumorah, September 22, 1825. Joseph recorded in his history: “In the month of October, 1825, I hired with an old gentleman by name of Josiah Stowel” (History of the Church 1:17). 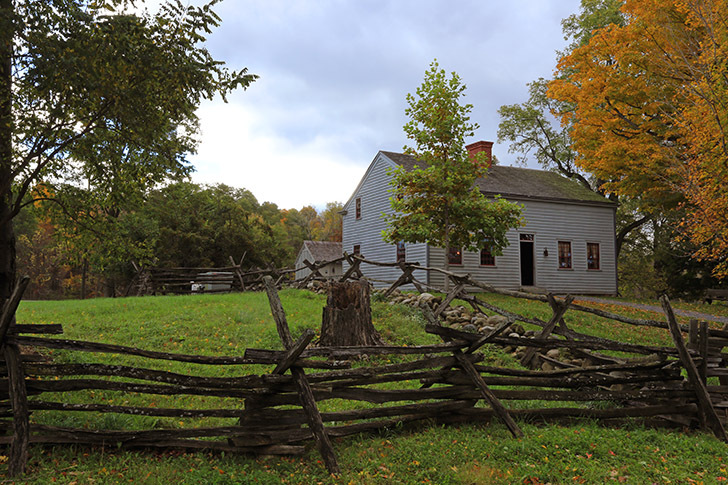 At this time, the Smith family house had been under construction for three years, and Joseph first became acquainted with Emma Hale; that is, in late fall 1825. Joseph Knight Sr. was born in 1772 at Oakham, Massachusetts. He married Polly Peck about 1795 and moved in 1810 to a farm at Colesville, Broome County, New York, where he and his family remained for nineteen years. (See Papers, p. 496.) Joseph and Polly had seven children, including Newel and Joseph Jr. The Knight family would play a critical role in the Restoration by helping provide the means for Joseph to translate the Book of Mormon and being a constant support to him throughout his life. Emma Hale was born July 10, 1804 (she was seventeen months older than Joseph), in Harmony, Susquehanna County, Pennsylvania. Isaac and Elizabeth Hale lived in a comfortable home (foundation dimensions are thirty by forty-two feet) with their nine children. Clearly Joseph was trying to help raise the money for the last payment on the farm. Joseph came back to the farm sometime in November 1825.